Kombucha is a fermented beverage which has taken the world completely by storm. If that new cafe down the road doesn’t offer it on their menu, it’s not worth going to. Or if your local supermarket doesn’t stock a wide variety of kombucha on their shelves, it’s not your local anymore! And if your go-to health food store doesn’t supply it, it’s hardly a health store at all! You get the point. Kombucha is trendy, and if a food establishment wants to tap into the rapidly growing alternative health market, they need to provide it. But while you may roll your eyes at what many consider to be “just another fad,” it looks like this one is here to stay. Kombucha has become popular because it tastes great, it’s low in sugar and it can be carbonated. It is here to stay because it’s absolutely amazing for your health! Kombucha belongs to a family of foods called probiotics. Fermentation is the process by which certain compounds (usually sugars) are converted into different forms by the activity of bacteria or yeast. Kombucha is created by first steeping black or green teabags in water, then adding a whack of sugar. After this point, a symbiotic colony of bacteria and yeast (SCOBY) convert the sugar first into alcohol, then into acetic acids and a range of other acids. It’s this combination of both probiotic power and amazing acidity that gives kombucha its sought-after properties. 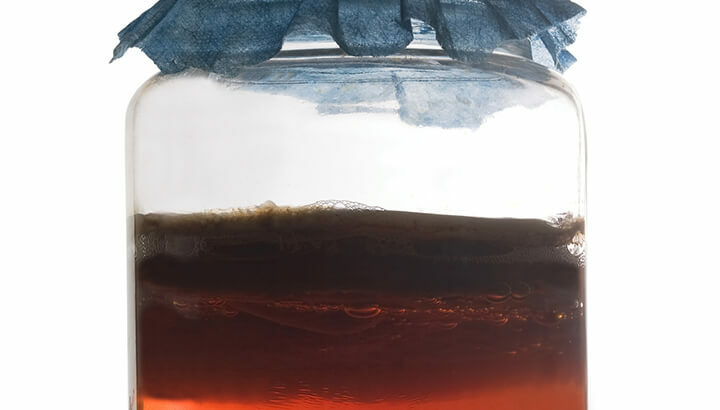 While most at-home kombucha brewers typically remove the bulk of the SCOBY at the end of each ferment (while you can swallow the SCOBY, it’s pretty darn unpleasant! ), much of the beneficial bacteria and yeast remain in the beverage. Thus when you drink kombucha, you’re re-stocking your gut with millions of the little good guys with every sip. The other half of kombucha’s dynamic duo of health is acetic acid. This acid performs a range of beneficial functions, including alkalizing the body, killing off harmful bacteria and fungi, and aiding digestion. The more you learn about kombucha, the more you’ll come to understand why it’s not just a fad. Here are 19 more reasons why you should get your hands on some. The active digestive enzymes contained in kombucha, along with the plethora of naturally-occurring acids, help to ease your liver. The liver is your first line of defense against chemicals, heavy metals and other toxins in your body. Helping your liver out is a vital step towards achieving a low-toxin lifestyle. Multiple studies have examined the liver-supporting effects of kombucha. A 2013 article published in the Journal of the Science of Food and Agriculture sought to examine the hepatoprotective (liver-protecting) function of kombucha. Researchers found that two microorganisms commonly found in kombucha, Gluconacetobacter and d-saccharic acid-1,4-lactone (DSL), were key components of the hepatoprotective property in kombucha. Another study concluded that kombucha is “potent in preventing hepatotoxicity.” It also noted that this may be facilitated by both anti-oxidative and detoxification effects on the liver. Our bodies need many enzymes and bacterial acids to both detoxify and break down food. Your pancreas gets a much-needed break every time your drink it. This is a compound which binds to toxins. It enables our kidneys and intestines to excrete toxins more efficiently. More efficient excretion means less toxic waste floating around inside your body! This is a critically important antioxidant and an efficient detoxifier within the body. More vitamin C means fewer toxins in your system! As mentioned earlier, kombucha is a powerful probiotic. This means it contains high levels of beneficial bacteria and yeast cultures which colonize your gut and support healthy digestion. Gluconacetobacter species made up the majority of the bacteria contingent, comprising an estimated 85 percent of all bacteria in kombucha. Small amounts of Lactobacillus and Acetobacter strains made up the remainder of the bacteria group. Yeast populations in kombucha were almost entirely made up of Zygosaccharomyces species. Not exactly exciting stuff to the average person. But it’s nice to know that scientists are aware of what is actually in kombucha — and that they’re happy with what they see! Thanks to the acids and digestive enzymes contained in kombucha, you get a lot more bang for your buck from the food you eat! For this reason, drinking a glass of kombucha with nutrient-dense meals can dramatically increase the number of nutrients you absorb from those foods. Improving the number and type of gut flora greatly benefits your digestive tract. It also keeps your weight down and prevents the development of digestive issues like gas, bloating and constipation. Studies show that positively altering our gut microbiome results in reduced negative emotions, like depression and anxiety. Drinking it is a great way to naturally improve the mind-gut connection. Eating too many carbohydrates like bread, pasta or baked goods can lead to rapid weight gain. A 2012 study published in the Food Research International journal found that “kombucha beverage was able to strongly inhibit starch hydrolysis by porcine pancreatic alpha-amylase and the inhibition potency increased during fermentation progress.” These findings show that the compounds in kombucha reduce the blood sugar spikes caused by excess carbohydrate and sugar consumption. This, in turn, can reduce your risk of putting on weight. This is thanks to its high concentrations of acetic and organic acids, along with a range of enzymes, proteins and bacterial agents. 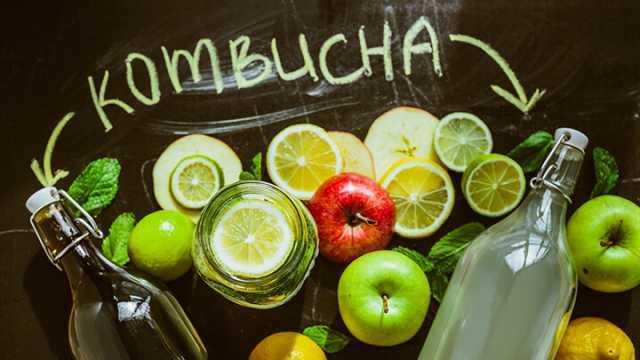 A study published in the Journal of Agricultural and Food Chemistry found that kombucha exerted antimicrobial activity against E. coli, Shigella species, multiple Salmonella species and Campylobacter. Considering these are all common and highly contagious stomach bugs, kombucha really is the real deal! It also prevents pathogenic bacterial infection. A 2012 study published in the Journal of Food Biochemistry showed “a broad antimicrobial spectrum of kombucha against a range of pathogenic Candida involved in several candidosis.” Interestingly, the study also discovered that the antimicrobial effects of kombucha were greater when it is made with green tea, as opposed to black tea. Studies are considerably lacking in this area. However, what research has been done suggests that this may be true. 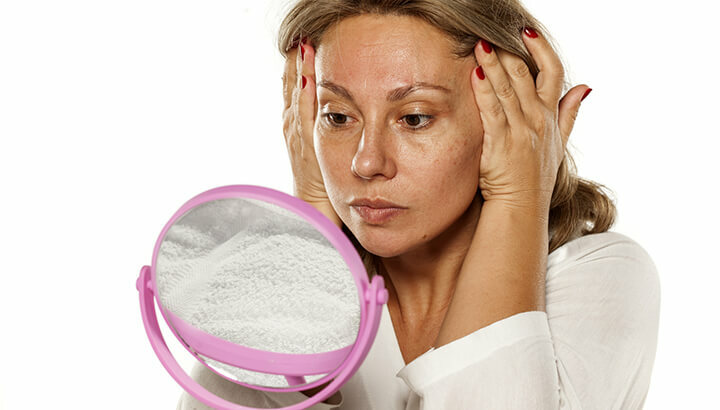 Studies have shown a notable decrease in common markers of aging with regular consumption. The antioxidants naturally found in green or black tea are concentrated during the process of fermentation. Antioxidants fight the activity of free radicals, which cause cell die-off through the process of oxidation, which is directly associated with aging. The high levels of antioxidants found in kombucha can not only slow the process of aging, but also contribute to fewer wrinkles and more supple skin. Regular consumption can help to treat and prevent the development of rheumatoid arthritis and other joint conditions. Many people who drink kombucha often report significantly lowered sugar cravings. This could have something to do with kombucha’s scientifically proven anti-Candida effects. Candida is a parasitic yeast which resides in our intestines and feeds off the sugar in our food. Lowered sugar cravings could also be due to the energy-boosting effect people experience when drinking it. Whatever the reason, if you’ve got a serious sweet tooth, kombucha is the way to go! Kombucha contains high concentrations of vitamin B12, an antioxidant clinically proven to support healthy nervous system function. Kombucha has strong anti-diabetic effects, as shown by multiple peer-reviewed studies. A study published in the journal of the International Society for Complementary Medicine Research concluded that kombucha can be used “as a functional supplement for the treatment and prevention of diabetes.” Another study showed that diabetic rats who consumed kombucha had significantly lower blood glucose levels. Many people stand behind the claim that kombucha is an effective natural remedy against cancer. A number of studies seem to agree with this. A 2011 study published in the Indian Journal of Biotechnology found that certain ingredients did indeed exhibit anti-carcinogenic properties. Researchers found that by fractionating kombucha tea with ethyl acetate, they were able to directly quantify the way in which kombucha acted upon cancerous cells. Researchers found that kombucha could cause a cytotoxic (toxic to cancer cells) effect on tumorous cells, reduce the activity of other cancerous cells, and reduce cell invasion and cell motility. While more research is needed, it seems like the sky’s the limit when it comes to the potential health benefits of kombucha. 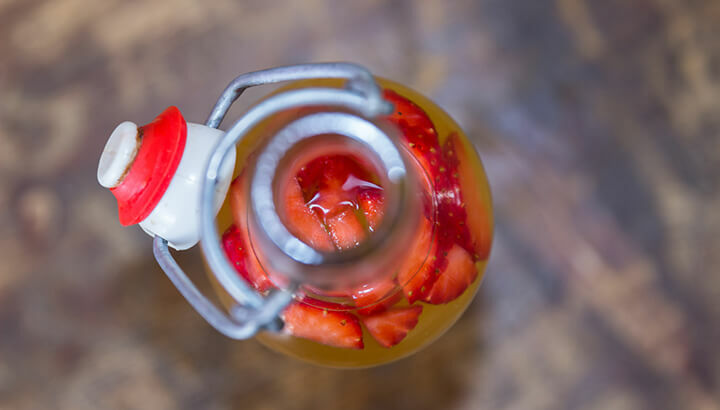 Considering how many health benefits kombucha provides, it may come as a pleasant surprise to learn that it’s amazingly easy to make at home! 1. To start things off, get your hands on a healthy SCOBY. You can get these from plenty of places, such as a friend (people who brew their own always have SCOBY’s to spare), online or a health-food store. One of the easiest ways to obtain SCOBY is to go down to the supermarket and simply purchase a small bottle of raw, unpasteurized “with the mother” kombucha. You can then use around half of this raw kombucha as your starter culture. Try to get all the gunky stuff at the bottom — that’s good bacteria and yeast! 2. Next, brew you tea. Place your teabag into the bottom of a large glass jar. Pour in one quart of boiling water, cover and leave to steep for 10 minutes. 3. Remove the teabag with a clean wooden spoon and add in the sugar. Stir thoroughly until sugar is fully dissolved. 4. Once the tea has cooled to touch, add in your SCOBY. Also add in a small amount of raw kombucha to help the SCOBY get acclimatized. 5. Cover the mouth of the jar with a cheesecloth and rubber band, and leave on the counter out of direct sunlight for two to four weeks. Try to keep it consistently at room temperature. 6. After a week or so, you should see a film start to form on the surface. This is your new SCOBY! After another week, start smelling your kombucha. When it begins to smell less sweet and more like vinegar, it’s time to start taste-testing! 7. Your kombucha is ready when most of the sweetness is gone yet it’s not too acidic to prevent you from drinking it. Remove the SCOBY, transfer into another glass jar, seal with a lid and keep in the fridge. Need more reasons to make your own kombucha? Here’s one: it may help with eczema and other skin disorders. Find out more here. Hey Buddy!, I found this information for you: "19 Reasons To Drink Kombucha And How To Make Your Own". Here is the website link: https://www.thealternativedaily.com/how-to-make-your-own-kombucha/. Thank you.